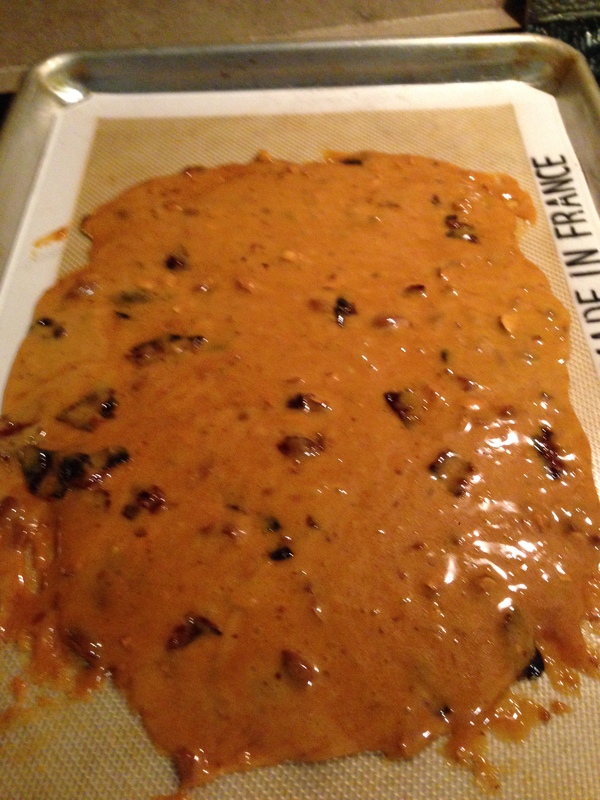 This weekend I decided to try to make an item I’d seen across instagram and pinterest, Bourbon Bacon Brittle. 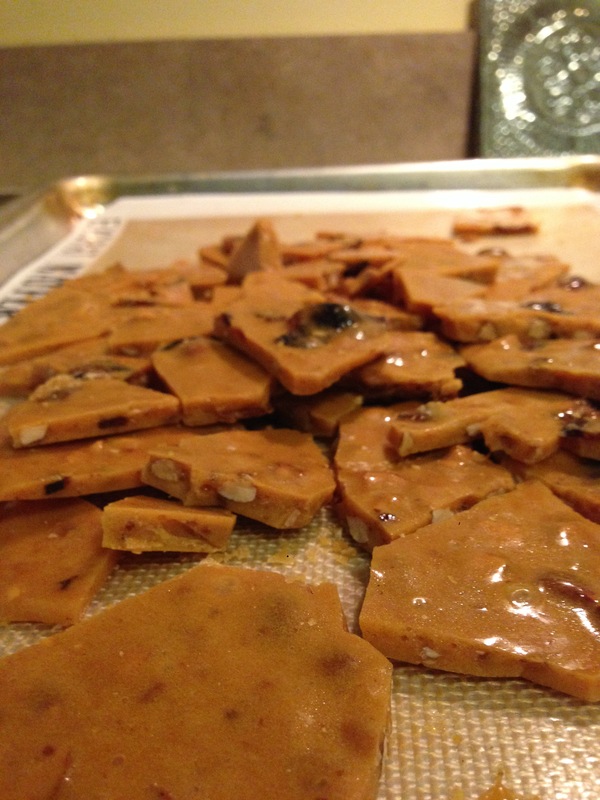 Now, I wouldn’t say I was a brittle expert, but I’ve probably made more batches of brittle for gifts than I’ve made any other food product (besides boxed mac and cheese!). I’d never put anything besides different kinds of nuts in the brittle though, so I wanted to give it a shot. Let’s start with what I did and then I’ll tell you what I’m going to do next time. 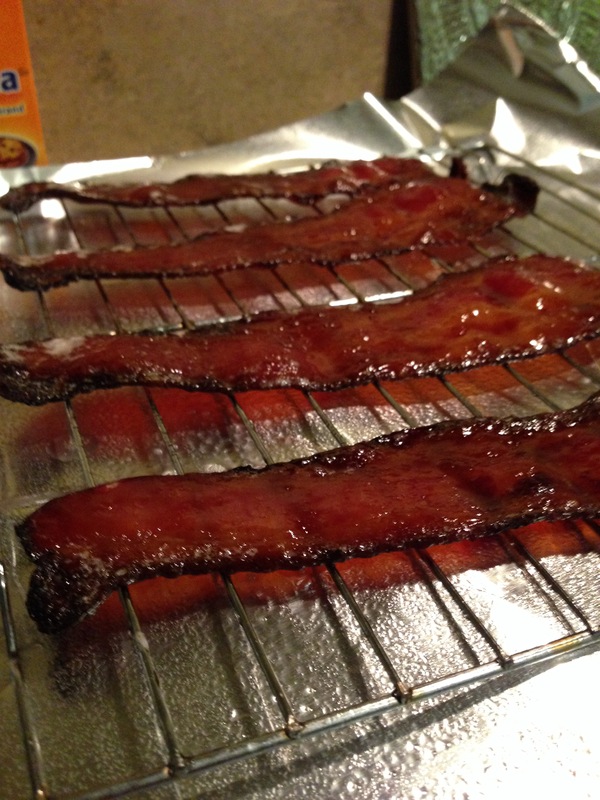 Take the tray out and flip bacon on the rack. Brush bacon with glaze again. Inspect bacon for done-ness. It will crisp up some after you take it out. Get everything measured and prepared. Once the temp hits the sweet spot, you’ll be running around like crazy otherwise. Mix sugar & corn syrup in pot and cook over medium heat. Constantly stir mixture until it starts boiling then don’t touch it until it reaches 310 degrees. Once it reaches 310, stir in almonds and bacon and cook 2 more minutes. Once mixed, spread quickly onto pan and let cool. Like I said above, I won’t get the thick cut bacon next time. It took longer to cook and the pieces were a bit chewy in the brittle. It was still delicious but I think having it be crunchy will make it even better. I also put the bacon in the brittle with the almonds. I believe this basically wiped out a lot of my glaze that was on the bacon. Next time, I’ll wait until the very end (after the vanilla, butter and baking soda addition) so that the bacon retains as much glaze as possible. Great recipe. I have also tried to glaze bacon in the oven so add into chocolate chip cookies – and it also turned out chewy. I just prefer to fry it, until it is crispy, then I finish it off in the oven with a bit of maple syrup (so, sort of glazed). That sounds like a wonderful idea! 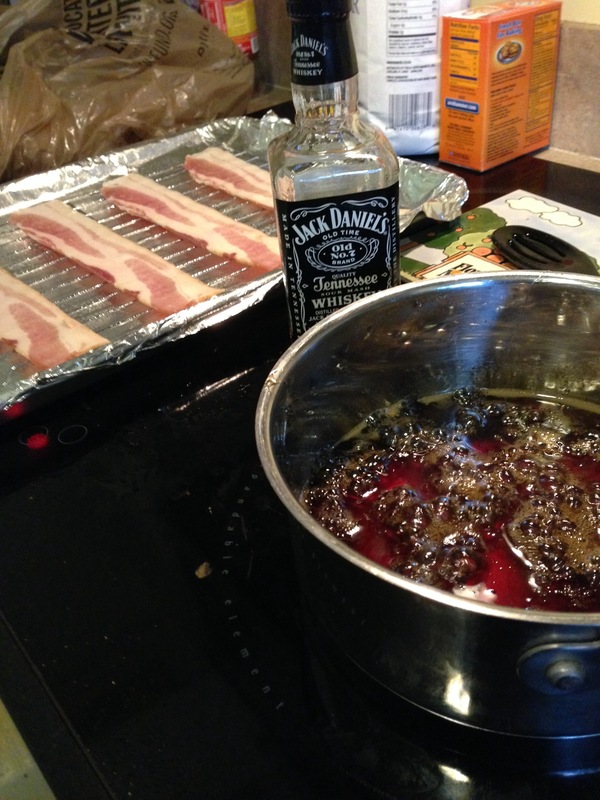 Did the maple flavor stay with the bacon doing it that way? Yep. I just let it soak a while before going into the oven (about 5 minutes). It also depends which bacon you decide to work with, I find that leaner bacon doesn’t work as well.